Experience Patagonia and its unique ecology, culture, and conservation and restoration efforts, while traveling through some of the most beautiful landscapes on earth. The majority of the course will involve field work and backpacking through pampas, old growth forests, and alpine ecosystems while learning about ecological, restoration, and conservation principles and issues. In addition to readings and assignments, you will learn from interactions with South American scientists, practitioners, conservation leaders, students, and local people. This course explores the ecology, conservation, and restoration of mountain ecosystems in the Aysen region of Chilean Patagonia through field learning and exploration. Chile contains temperate forest and grassland ecosystems, volcanic mountains, and gravel-bed rivers that, at first glance, appear similar to the western United States. Yet due to its distinct biogeography, ecosystems of Chile vary considerably from those in North America. By spending time in the backcountry, students will have an opportunity to explore ecological theories in the context of contrasting environments. In addition, they will learn about the history of resource use and environmental degradation of the Aysen region, which contains enormous water, mineral, timber, fisheries and tourism resources that are considered integral for the development of Chile, as well as conservation and restoration challenges. 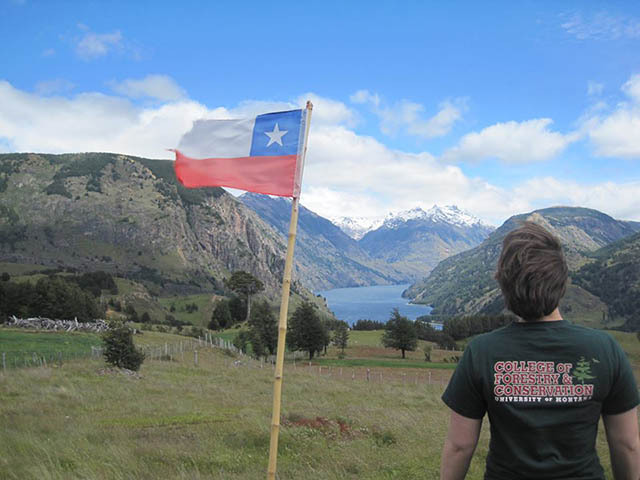 Exploring current natural resource issues in Chile will increase students' understanding of global conservation and restoration and will also give students new insights on ecosystem management issues in the western United States and other areas in which they live and work. The 21-day course includes a six-day service-learning research protect in collaboration with CONAF (the Chilean organization responsible for managing national forests and parks), an eight-day backcountry trek through three protected areas, and time to explore local communities and Chilean culture. In addition to direct field experience, the course will include daily readings, class discussions, and meetings with Chilean scientists, resource managers, and community members. After returning to UM, students will participate in a weekly class during spring semester in which they will learn the basics of data analysis and reporting and will give a presentation on their component of the group research. No previous knowledge of the Spanish language is required; all instruction will be in English or translated to English. However, students will be in the field with native Spanish speakers every day, and the course is an excellent opportunity to gain or improve Spanish-language skills. Because the course involves extended time in the backcountry, students should be prepared to learn in an outdoor setting, with unpredictable weather, and to be adaptable to changing and sometimes challenging situations. A Note on Conduct: We will be living in a group setting in remote environments and as travelers we will be representing both our group and our country. Therefore, personal conduct is integral for a safe and rewarding trip. We will educate you on proper expedition behavior and expect you to follow the guidelines set forth. Students are expected to refrain from drinking and illicit drug use. Students will also be expected to respect the cultural norms of Chile and act accordingly. We will not tolerate inappropriate behavior. This course is instructed by Cara Nelson, Department of Ecosystem and Conservation Sciences, W.A. Franke College of Forestry and Conservation, University of Montana. Cara is an Associate Professor of Restoration Ecology, with expertise in temperate forest restoration. She works in both the western U.S. and in Latin America, where she is currently conducting research in Chile. Space is in this course is limited. The application deadline is TBD. Application for funding through the Franke Fellowship program is separate from application for admission to the course. To apply for funding: 1) See: http://www.cfc.umt.edu/resources/sustainabilityfellows/; and 2) request a letter of recommendation from Cara Nelson, the Patagonia course instructor (cara.nelson@cfc.umt.edu). Funding applications are due TBD. A program fee (which covers accommodation at hostels and motels, group activities and excursions, emergency and international health insurance, in-country transportation, and some meals). Students in the W.A. Franke College of Forestry & Conservation are eligible to apply for funding through a Franke Sustainability Fellowship.